It’s often said that the pace of life moves slower in Norfolk. And slower still on the Norfolk Broads, the county’s most famous asset – a vast network of rivers and man-made lakes where abundant wildlife thrives beneath wide open skies. 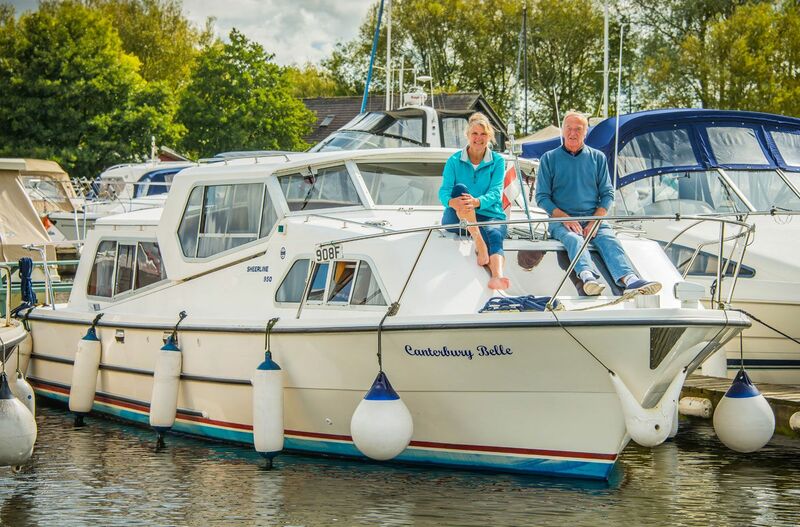 For Bill and Jill Webb it’s the perfect place to escape to, their cosy river cruiser – the Canterbury Belle – a sanctuary from the stresses of everyday life. 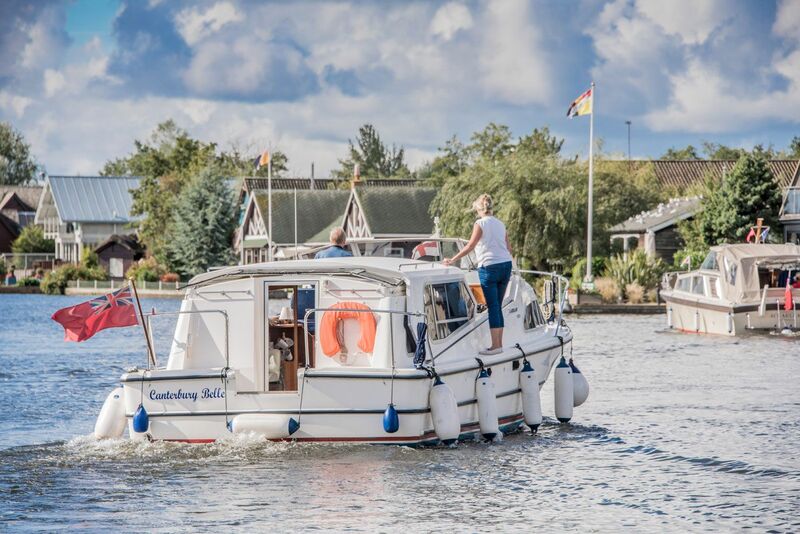 The couple make the trip to the pretty Broads village of Horning from their home in Kent most weekends, the tranquility of the river that awaits more than compensating the three-hour journey by road. “It’s far enough away to be a bolt hole,” says Jill, 60, who works in security. “You can come away weekends and even if you don’t take the boat out on the river, it’s just so peaceful for us away from the hustle and bustle of the job. It’s where we escape to the tranquility of the rivers. For Bill, a retired gaming machine engineer, it’s “a total break from everything in life”, a chance to see kingfishers and otters vie for fish and hear the booming mating call of the bittern, one of Britain’s rarest breeding birds. It was memories of family holidays on the Broads in the 1980s that brought the couple back to boating 10 years ago. The couple started browsing boats for sale in Norfolk and when downsizing the family home released the funds to buy a 27-foot Freeman cruiser, they grabbed the opportunity with both hands. Their current Sheerline 950 is their fifth boat and, sitting in the open cockpit in the warm autumn sun, Jill remembers those summers spent messing about on the river. “It was great fun – we had all four kids with us plus other family, aged from seven to 57, maybe 10 or 11 of us on a boat,” she says. “The kids were all involved, they could drive the boat and help moor up, all under supervision. We used to swim in Oulton Broad, though I’m not sure we’d do that now! “Being here now takes us right back to those times.” With an empty house too big for the two of them, thoughts turned to doing something for themselves. 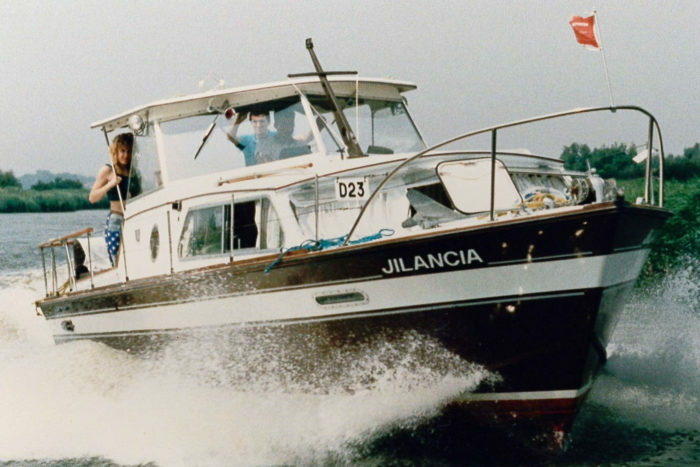 “We found ourselves on our own with no kids at home,” says Jill, who would help her brother, a keen sailor, as a child. “We moved from a big family home to a smaller house and thought ‘what are we going to do for us? What are we going to do with our leisure time?’ “If you buy something static, like a caravan, you can’t move about but with a boat you can have a change of scenery. 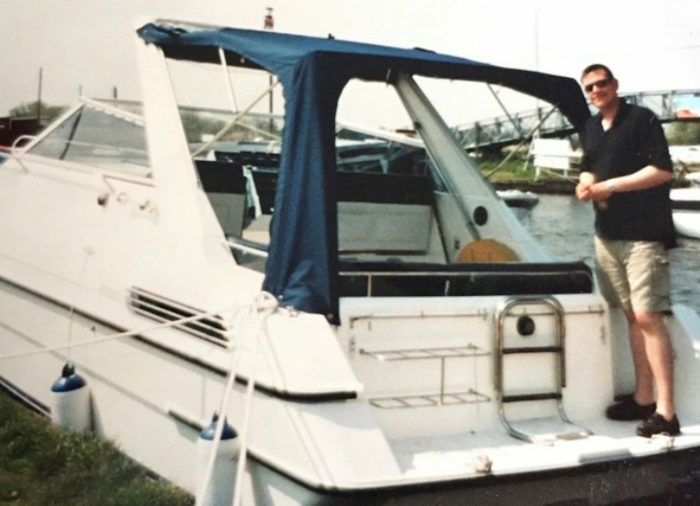 Because of those previous holidays on the Broads we thought it would be nice for us to go back there.” And they’ve been boating on the Broads on and off ever since, barring a near two-year hiatus in a static caravan at Hopton. “We thought at one point about giving up boating, but it wasn’t for us. We decided that we really missed the water,” says Jill. All of the couple’s boats have been bought from Norfolk Yacht Agency, and all moored at Horning, where the company has an office. The Canterbury Belle, built in 1999, is their second Sheerline 950, and has a central cockpit area clothed in wood and space at either end to comfortably sleep four. Bill, 76, who found his sea legs while looking after gaming machines on cross-Channel ferries, says the switch back to a Sheerline was born of practicality. “We had a Shadow 26, and I could not get on and off that thing!” he explains. “We were looking for another Sheerline and were after one that came off the Thames, which had been seriously neglected. 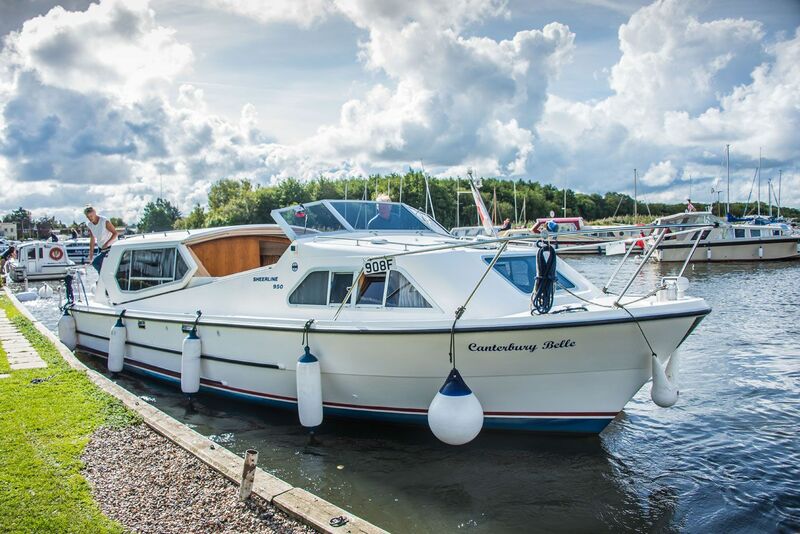 “We were recently hit by a hire boat though, which was not pleasant, but without the hire companies and holidaymakers the Broads could not survive for the enjoyment of us all,” says Bill. As well as the pleasure of boating itself, and the peace and quiet of the tranquil moorings, there’s another side that’s equally important to getting the most out of a life on the water: community. In their younger days, the couple – who have been together for 40 years – would get their kicks on the road in a Panther Kallista sports car and a 1600cc motorcycle cruiser (“Jill would fall asleep on the back!” says Bill), but now they couldn’t be happier with a more sedate life on the water. “It’s just beautiful and lovely,” says Jill, and who could argue with that?